Woodlands Hospice is delighted to announce the launch of its new cycling group – the Woodlands Wheelers! The groups’ aim is to encourage keen, like-minded cyclists to come together in teams and take part in local and national cycling challenges and events in aid of Woodlands Hospice. The group is the brainchild of Tony Bonner, an avid cyclist who has supported various charities through his cycling efforts taking part in many exciting and challenging events such as the Coast to Coast England, Workington to Tynemouth cycle and London to Paris with Discover Adventure. Tony has a personal connection to Woodlands after the sad loss of his sister who was a former patient at the Hospice. This led to him approaching us about his idea of a cycling group by way of supporting the Hospice to achieve its fundraising goals. 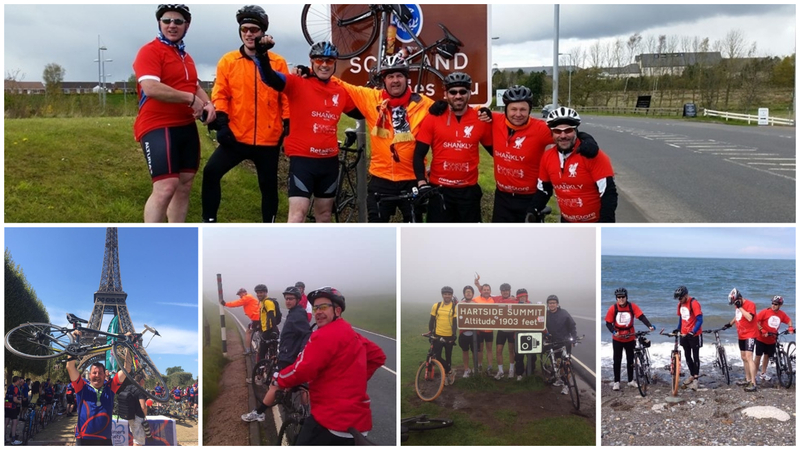 Tony Bonner and friends completing various cycling challenges. “My sister, Dawn, passed away very peacefully in November 2016 in Woodlands Hospice. Tony has recruited some fellow cyclists to the group and they already have their sights on a challenge! The first challenge our Wheelers will take on will be the Liverpool to Chester Challenge on Sunday 7th July 2019. Tony’s plan is to help Woodlands to get the group off the ground by supporting us at cycling events and challenges for the group’s first 12 months. However, the idea is to recruit more members to the Woodlands Wheelers group over this time to continually have support at the many local and national events taking place in terms of cycling. If you’re a keen cyclist and are interested in joining Woodlands’ new cycling group and take part in the Liverpool to Chester Challenge this July, please contact the Hospice’s Fundraising Team on 0151 529 8193 to discuss further. You can also join our Woodlands Wheelers Facebook group for the latest news, event dates, as well as cycling advice and support from fellow members of the group.